we've been growing this little homestead steadily since we've arrived here at the farm. lots of people have expressed both their concern & surprise that we would have animals on the farm this early as we are renovating both the house & the dilapidated barns. but, spring is the cheapest & most efficient season to buy & add livestock. 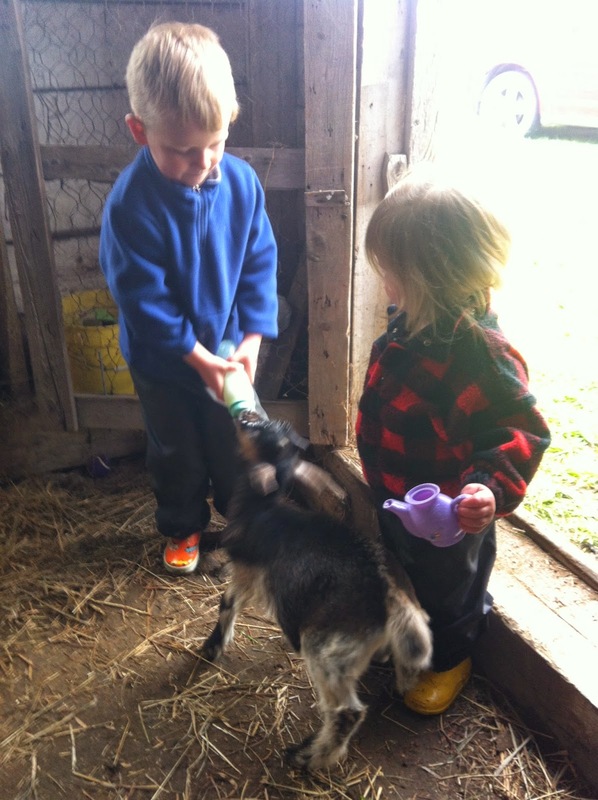 and most of the kids' & my excitement about the farm has centred around the potential livestock themselves. we should have probably waited. we could have waited. but we didn't & i can honestly say it has been my saving grace. although a bit naturally out of what would be most people's logical progression, (buy farm, settle kids, then renovate the house, then renovate the barns, then carefully plan & research livestock & invest next spring or two when we know what we're doing), it's more our style to take on nine massive projects all at the same time. even though we have had several livestock calamities (the tim horton's parking lot pig escapade, the case of the missing goat horn & the horsegate fiasco of 2014... i hope to pen these later because i don't think i'll believe them myself in a few years), they have also been one of my greatest sources of peace through this transition. i so look forward to my 20 minutes both morning & night that i get to interact & watch & play with them. such a nice change in pace. for the evening chores, the kids are usually in bed & i can just saunter out to greet the pig, play with the goats, collect duck eggs or ride mabel with the deer in the back few acres. this is not to say that it hasn't been a pretty steep learning curve. i think just in our first week here i had to learn how to get a giant tic off an unsuspecting pig, how to build a "duck-tractor" in under 10 hours, how to clean a chick's "vent" & how to transport an angry goat in the family van without it bashing out my back window. it has been a lot of youtubing & contacting people on kijiji. and although doing it all by myself while trying to competently mother & settle into a pretty eccentric house has been overwhelming at times, it has also given me a huge confidence boost. if i can teach an ornery pig who's boss every morning, well, i figure i can do a lot of other things i've never before too & succeed! so stayed tuned. lots of stories to come. here are a few more pics of some of the new livestock around the property... just so you'll know who i'm talking about when i write about them later. they each have their own stories to tell... but that's for another time. thanks for joining me on this little adventure! teaching horse & apple eater. what to do with a goat placenta but it's looking like i'll have to learn! to potentially have a little baby around again :) goat duala-ing here we come! and churchill. he's just so nice. unless he's hungry. 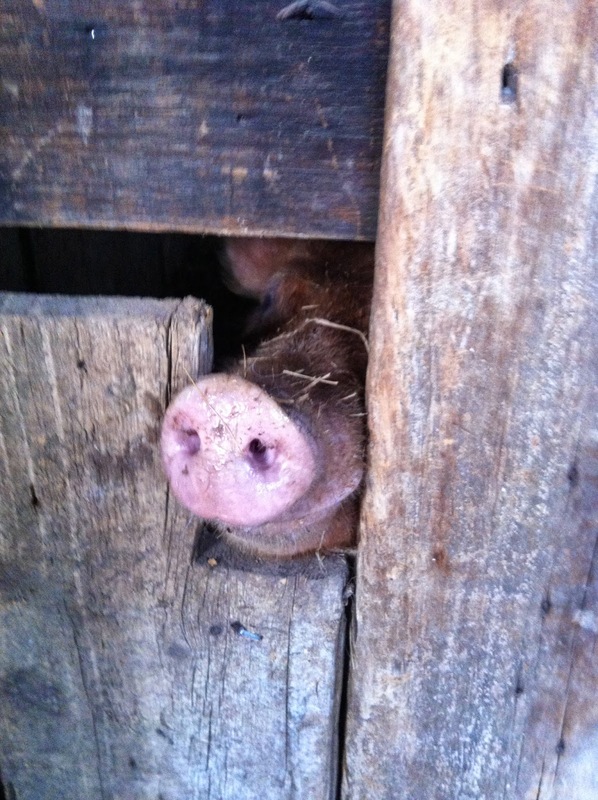 our breeding boar (we get two spotted girls in a few months). 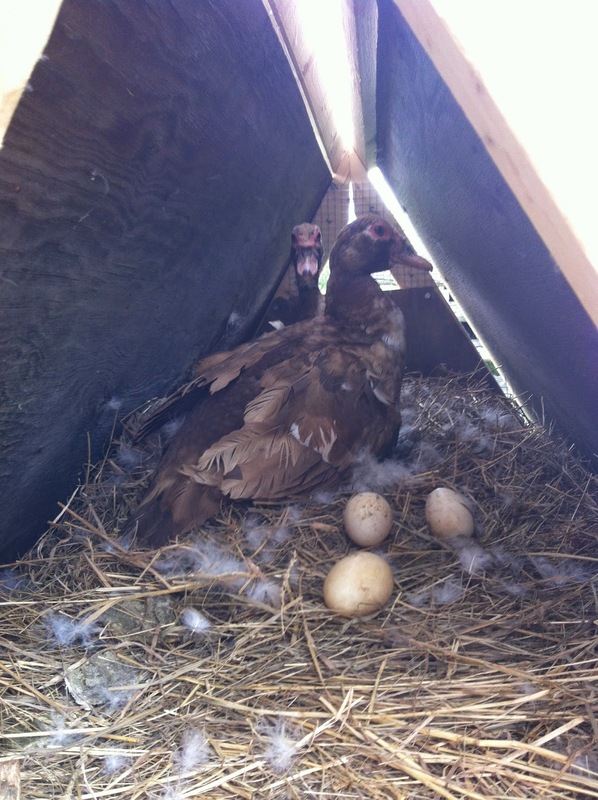 they'll hatch out at least a dozen ducklings to raise as meat ducks. Nice catchup, Sarah. Looking forward to reading more about your lovely farm animals and coming to visit you on the farm.